Black metal legs combined with a dark oak finish wood top create a beautiful piece that will sit well in any dining space. 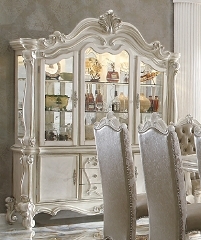 Matching chairs are upholstered in ivory linen like with button tufting for an upscale look. Dark oak and Black metal Finish.